Ingredients: Simply stemed with white wine, chilli,and garlic. Clams tossed with linguini, own liquor, tomatoes, oregano and saffron. If a sunless summer gives you green tomatoes…Make chutney! Cyrille made two different green tomato and apple chutneys with the stubborn fruits who opted out of ripening this summer. Recipe? Well… Cyrille is infamous for NEVER writing down any recipes— so, in honour of the blog– he wrote them down. The recipe should now follow— but after searching all afternoon for the coveted pieces of paper— they are not to be found. From the Queen of Organisation– this is a painful defeat. The lighter green chutney pairs well with poultry or ham while the darker is great with wild game terrine or strong cheddar. 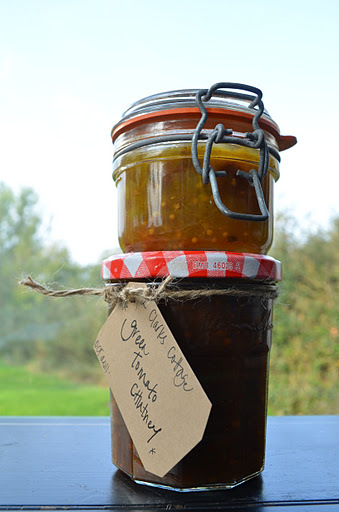 As much as I love sweet summer tomatoes, I secretly hope each season that some protest and stay green– just so our stash of chutney can be replenished. It is a lot of work… but once jarred, they can last for years… and make great gifts! The past few weeks have presented my mind, body and soul some new endurance tests. A Bikram Yoga studio opened in the neighbouring village. You could not, not notice it. Bright three-foot yellow lettering “BIKRAM YOGA” chanted at me each time I sheepishly drove past. I enjoy yoga– I am far from a yogi– but do enjoy feeling invincible in warrior pose and hanging out in plow pose. Bikram Yoga has always alluded and intimated me. First of all- I am not one for extreme temperatures. So the idea of willingly subjecting myself to 105˚F temperature for 90 minutes just seemed a bit dramatic if not traumatic. With the desire to get back in pre-maternity shape, I had been scouting cardio options to coincide with my husband’s day off for watching our daughter. As fate would have it-the only class to fit his day off led me straight into the inferno. And so, last week, I found myself inside the daunting “BIKRAM YOGA” studio being coaxed into signing up for a 30-day intro offer to experience as much heat as I could take. First class- Sunday, 10 am. Outside temp- 64˚F. Inside- 105˚F. The website advises you to bring two towels, a litre of water and to arrive no less than 15-minutes before the start of class. With my gear in hand, I made my way into the studio to warm up. The heat greeted me like a bad hangover. My skin started to glisten with the little effort used to put down my mat and towel overlay. My eyes instinctively hunted down the wall clock, sending panic waves to my brain “You will not be able to sustain this heat,” advised my brain. ” You did not have a good night’s rest (again) and you really should not over do it….you just had a baby” (ummm…8+ months ago…think that card is played). Heat. Sweat. Light headed. 14 minutes until class starts. Parched. I laid down. Mistake. I stood up. Dizzy. I sat and tried to fake a serene meditative stare at my flushed cheeks in the mirror. Who was I kidding? Why I am here again? 10:01. Finally. The instructor enters. And then begins the first of 26 Hatha yoga postures and 2 breathing exercises. Each posture you complete two sets- so you are actually doing 52 postures and 4 breathing exercise (I did this math half way through the series). After the first breathing exercise, sweat is dripping off me. I am self concious thinking I must be in terrible shape- until I hear little drips around me and realise we all are sweaty hogs together. The heat is an obstacle. Playing with your brain, testing your strength. Trying to break you down. Half of my brain begs me to get out while the other half wants to push through. You draw strength from your breath and your entire focus is on the air entering and leaving your nose. Nothing else. Your breath gives you balance for holding the pose, and with each exhale you push deeper into the stretch. As I focus on the instructor’s voice, my breath steadies, my heartbeat surges and sweat streams down my limbs. Is it time for meditation and cool down? 45-more minutes to go…. I have finished my first class. I look at myself in the mirror. My cheeks are not flushed- they are deeper shade of plum. The towel covering my mat is soaked through, and I am drenched in my own sweat. I feel exhausted but, strangely, more energetic than when I arrived. I am not sure if I have loved or hated the class. This was the hardest test since labour that I have endured in the past 8 months. Not physically— but mentally. Last week I started back to work on a fixed 8-week contract job. An ideal transition allowing me to dabble back into work two days, bring home the bacon (even if just some scraps) and have the rest of my week for my favourite job- Mummy. Going back to work sounded so easy- until Monday morning. I gave Ouisie her early morning feed, got her back to bed and I started to get myself ready for work. All was fine until I watched my husband cuddling her in his arms as I stood in the hallway dressed in my suit about to leave. The reversed roles made a lump rise in my throat that was hard to swallow. But swallow I did. I introduced myself to my new desk which seemed so cold and unfamiliar. My stomach, a roller coaster of nerves, like the first day on the job. Except- familiar faces welcomed me back and with their sincere smiles and good wishes the nerves calmed. I am back in the saddle. As before, I showed up on time. But now- you can bet your bottom dollar- I also clocked out on time. My head stayed down for the full 8-hours. No lingering at the water cooler with colleagues as those minutes are now treasured at home in the evening with Ouisie. The end of the day. I switched off the computer and clocked out. I arrived home to a slobbery toothless grin and my heart melted. We made it through the first day with no tears and her smile reconfirmed that we are going to be okay. Since then, I have returned to the inferno for a 2nd (and 3rd) class and clocked out (on time) for day two at work. The 90-minutes in the Bikram Studio and the two days at the office have been rejuvenating. While my “Mummy hat” is always on, I feel that I am finding a healthy balance which will allow me to be a better spouse, mum and breadwinner all the while not forgetting about my own self. On that note, it’s time to get to bed– work in the morning. Bring it on week two!